My interest in alternative healing began when I was in a car accident 20 years ago. I got severe whiplash and suffered from chronic pain. As a result, I turned to alternative medicine to heal. Thanks to natural therapies, I fully recovered and even rode a bicycle across Canada and completed three triathlons. Now, I teach and practice Chinese reflexology to help others improve their health and vitality. Thus, it’s only natural (pun intended) that I would look for alternative healing methods for my cat, too. I always take Furball to a vet when he’s sick, but once the acute phase is over, I turn to holistic healing practices to help my cat stay healthy and thrive. Here are five alternative treatments that I found helpful for my cat. Common sense dictates that giving a high-strung cat needles is not a good idea. However, after Furball got over a bout of pancreatitis, I was looking for ways to support his recovery and improve his digestion. 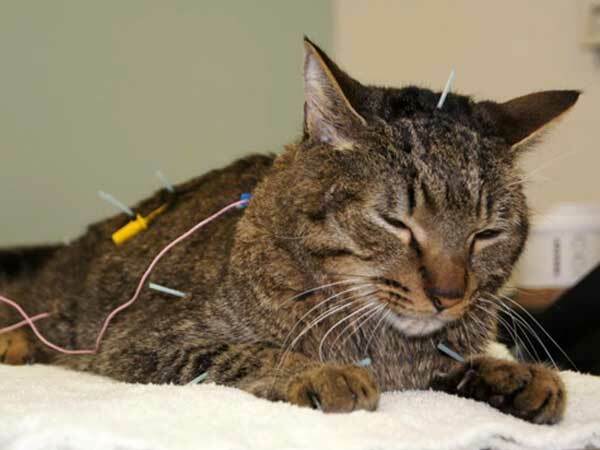 I found a licensed veterinarian who also practiced acupuncture for cats. When the first needle was inserted, Furball froze. On the second needle, he let out a hellish hiss and leapt straight into the air, claws flying. The vet must have been used to this reaction because without breaking her stride, she snatched Furball out of the air and held him firmly on the table. When she was done, Furball had a handful of needles sticking out of him. The needles didn’t seem to bother him at all and they were removed after a few minutes. I noticed that Furball’s digestion improved almost immediately and he never had a problem with his pancreas again. When Furball gets stressed, it upsets his digestion and he starts throwing up daily. The holistic vet recommended a probiotic formula especially made for cats. Probiotics are microorganisms that occur naturally in the intestinal tract and help to support healthy digestion. After a few days of Furball licking a dollop of the acidophilus gel off my fingertip, he stopped vomiting. The holistic vet also recommended using a flower essence formula called Rescue Remedy to help keep Furball calm. Whenever there’s something going on that I know will stress him out, I give Furball a drop of the pet version of Rescue Remedy. I’ve used it to soothe his nerves after an earthquake and also when we moved homes. Rescue Remedy really helps to keep him mellow, which is good because stress adversely affects his digestion and is a known trigger for cystitis too. It’s believed that the Akashic records are a transcript of the soul’s journey and thus are useful for providing divine guidance. When I met someone who could read Furball’s records, I was excited to gain insights into his behavior and well-being. I learned that Furball had dark energy around his heart and lungs. This was because he felt like he had been replaced when my son was born and he was very sad about it. The Akashic record reader suggested the whole family spend more time with Furball and we took her advice to heart. We now have a much happier and well behaved cat. As someone who practices Chinese reflexology, I wholeheartedly believe in energy healing. 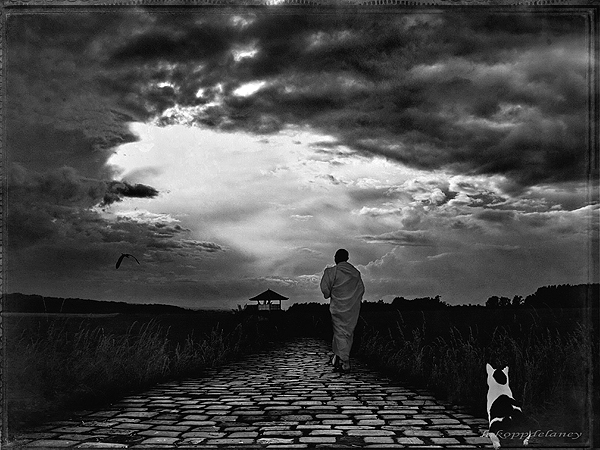 Qi (pronounced "chee") is the life force energy in all living things and when it fades, that’s when life ceases. Several months ago, Furball appeared to be on the brink of death with his life force energy draining away. I found him lying like a limp rag at the bottom of the stairs. When I spoke to him and petted him, he didn’t even lift up his head. He had been going through a period of recurring cystitis. He had already seen the vet multiple times and had been given fluids, antibiotics and antispasmodics. Furball seemed to get better for a few days, but that night, he took a turn for the worse. He looked so pathetic that I was crying inside thinking that my little cat might not make it through the night. Out of desperation, I tried giving him some Qi. I placed the palms of my hands on the Back Shu points for his bladder. Back Shu points are a type of acupuncture point (if you’re curious, you can visit my blog to learn more about these points, along with energy healing for animals). Immediately after placing my hands on Furball’s back, an amazing thing happened. Furball began to purr. The next morning, Furball was back to his normal self, eating and playing as if nothing had happened. He hasn’t had a recurrence of cystitis since that day. To me, it was a miracle, which is why I encourage people to be open-minded to energy healing and natural therapies for their pets and themselves, too. While alternative medicine doesn’t replace proper medical care, it’s another way to support health and well-being, and I’m all for healthy pets! 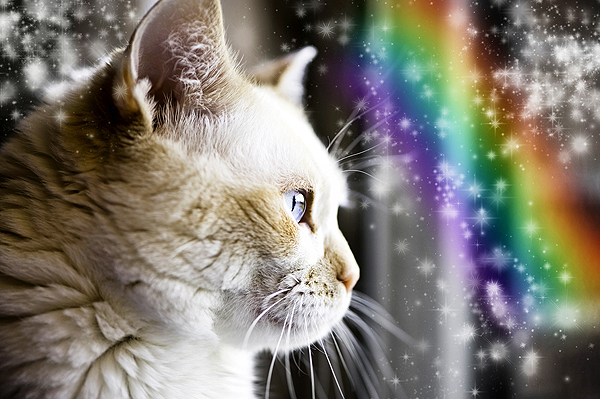 Have you ever tried alternative treatments with your cat? Let us know in the comments! About Holly Tse: Holly Tse is a green cat expert, lifelong environmentalist and the creator of Green Little Cat, a blog on eco-friendly living for cats and cat lovers. Practicing Taoist, Chinese Reflexologist and Dragon Spirit Guide who has experienced more than nine past lives and can bend reality at will. Totally into alternative healing, but her Achilles’ heel is reality TV cooking shows. As a Canadian expat, she uses an American spell checker for her Catster articles.